Many of us have been paying increasing attention to the safety of our firearms of late, and rightly so. We can’t afford not to. The Steelwater AMSW592818 Heavy Duty Safe is a sure fire choice in protecting your fire arms. Steelwater has been around for a while, and has gained the trust of many hunting and gun enthusiasts. Protecting our kids requires keeping them away from the safe lock, too. Over time the curiosity of our kids might lead them to try hundreds of combinations if the safe is left unattended. The 12 gauge steel construction ensures that no burglars will be able to get in from the outside. Power tools are almost useless against the thick steel. The composite constructed 4 ¾” thick door, plus 1″ diameter Solid Steel Locking Bolts, make the door the hardest part to get through. The 8x More Drill and Ballistic Resistant Hardplate is more heavy duty than typical safes. This protects the lock and vulnerable areas from manipulation and drilling. With a gear driven locking system (not cheap cam drive) and EMP Proof Electronic Lock, you are provided with additional strength against drill, punch and pry attacks. These features combined make sure burglars will not be touching your guns. The Steelwater AMSW592818 has been 45 Minute Fire Rated @ 1550 Degrees. This is more than enough time to get your guns out safely and securely. Or if the fire is completely out of control, within 45 minutes the fire should be put out by the local department. 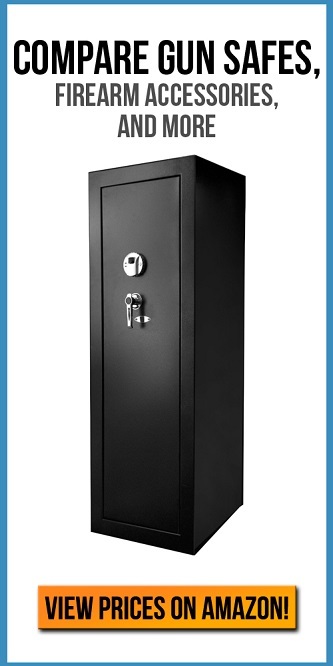 The Steelwater AMSW592818 is commonly advertised as a 16 gun safe. But as the manufactures acknowledge it stores an average of 8-10 long guns. It is possible to store 16, though. The safe also exceeds regulatory standards of California Department of Justice, for residential security containers. Giving you the ease of mind that your safe has gone through rigorous testing and came out on the winning end. Should you pick this safe up? Some customers like to bolt safes to the wall, because they fear damaging their foundations by bolting it to the floor. Bolting to the floor is by far the more secure option as safes are much more easily separated from a wall. In any case, this safe is 350 pounds – it’s not being wheeled out of your home any time soon. Mounting to the wall can also structurally compromise safes over the long term and is not recommended. In summary Steelwater AMSW592818 this is a beast of a safe. Naturally it’s 5-star rated by customers. The fire and security features are immense. Therefore it’s no surprise that the manufacturer is confident enough to give a lifetime warranty. Given the specification, if you are serious about protecting your firearms and burglary or fire are factors in your decision making, this is a very smart investment.